SHINE HAI Outdoor String Light is ideal light for adding a comfortable atmosphere, give an inviting warm incandescent glow that will bring any room or party to life. 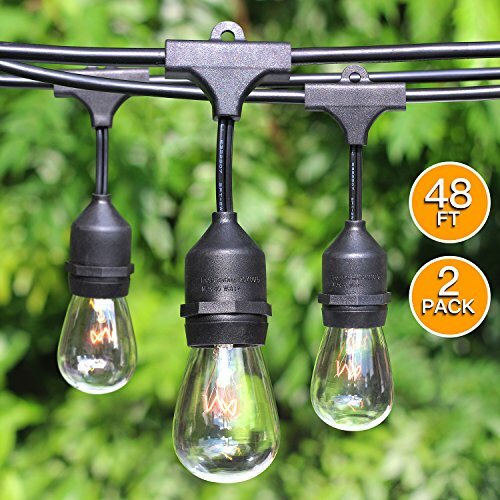 STRONGEST COMMERCIAL QUALITY AT A RESIDENTIAL PRICE - 2-Pack 48 feet black rubber weatherproof cord contains durable wire strung through 15 WEATHERPROOF light sockets, set about 3 feet apart. End-to-end connections, feel free to customize your arrangements. Heavy duty rubber construction throughout the molded sockets & integrated hanging loops. Compare to other hanging lights and YOU will definitely see how PRO ours are in quality. Hassle-Free Guarantee - SHINE HAI stands behind all of our products 100%. Please CONTACT US directly if you are not completely satisfied with your purchase, we PROMISE will get it resolved as soon as we can.